OdawaraPlum Festival is centered around Soga plum grove and Castle Park. Come out for the day and compare the various different varieties of plum blossoms. This place has links with the brothers Juro and Goro Soga, famous for the Tale of the Soga Brothers, one of Japan's three great vendetta epics. 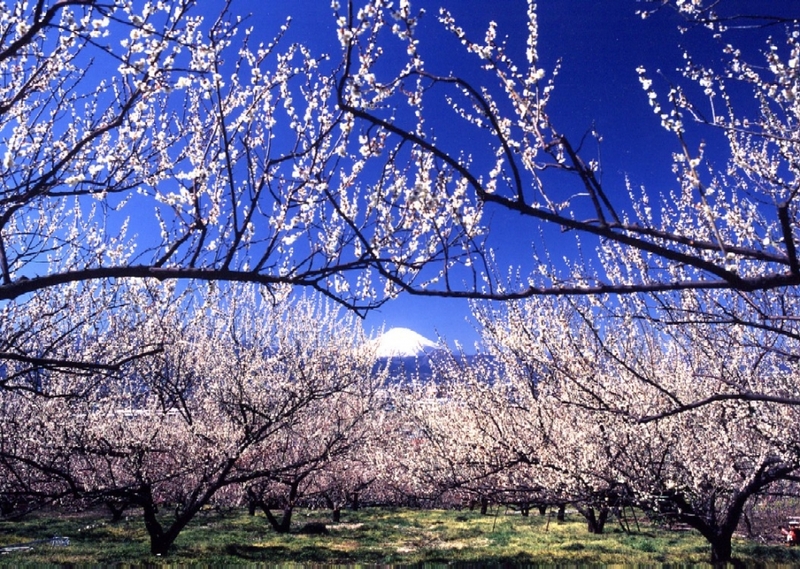 During the Plum Festival held every year in February, around 35,000 white-blossomed plum trees bloom in profusion with Mount Fuji in the background. Various events are staged during the festival, and local products such as dried plums and vegetables are also sold. Along with more than 480 trees in some 200 different varieties of plum spread along the mountain stream plum grove, roses, irises, and other flowers can be viewed on strolls through the park throughout the seasons. There are 300 varieties of tropical fruit trees and flowers in the Tropical Dome greenhouse year round. Take a bus bound for Flower Garden from Odawara Station, and disembark at final stop. With western plants obtained from various countries and a plum grove filled with trees around ninety years old, this garden offers views of lovely scenery throughout the seasons. Take a bus bound for Ikoi no Mori (Wanpaku Land) from Odawara Station to Tsujimura Shokubutsu Koen bus stop. Odawara Cherry Blossom Festival is held from late March through early April, and cherry blossoms can also be enjoyed at famous locations other than Castle Park throughout the city. Information about distinctive cherry blossom varieties follows below. This famous tree is more than 340 years old, approximately 13 meters tall, and around 4.7 meters wide at its base. With flowers that cascade like a waterfall at the peak of the blooming season, it makes for a magnificent sight. This early-blooming cherry has deep pink blossoms. Around 500 big and small trees bloom profusely in the Nebukawa and Enoura areas, where an Okame Cherry Blossom Festival is held while the trees are in bloom.